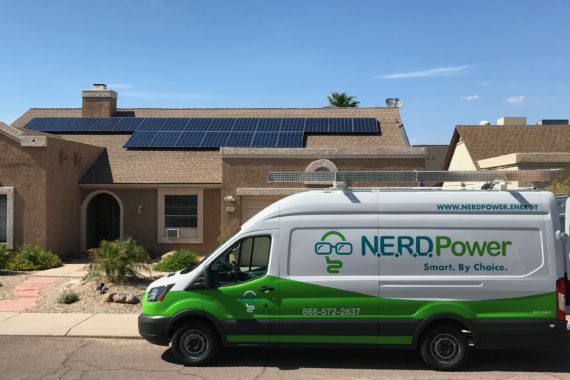 Nerd Power offers a holistic approach to home energy. It's not as simple as taking a glance at your usage and slapping panels on the roof. Your home is leaking energy, and it's costing you money. We first look to REDUCE the energy your home uses before we look to PRODUCE the energy your home needs to run comfortably. We have a principle we call "It's the same money". Meaning, in most cases, we can convert a home to using residential solar power, including the energy efficiency upgrades, for LESS than what you are paying your utility company now. The addition of energy efficiency upgrades, and PV solar, not only add equity to your home, but give you energy independence, and more freedom to control your thermostat without fear of your upcoming bill. We call that a No Brainer. Residential solar power is a clean and renewable energy source that can be used to produce electricity as well as heat your home’s water supply. Solar energy is the cleanest and most abundant renewable energy source available, and the U.S. has some of the richest solar resources in the world. The team at N.E.R.D. Power works with both photovoltaic (PV) and solar-thermal technologies to create customized solutions that maximize your home’s ability to harness the solar power necessary to satisfy your energy needs while containing costs. These days, more and more people are talking about the benefits of residential solar power. Many homeowners are excited about the opportunity of purchasing or upgrading to a solar home, and with good reason. Residential solar power can increase the value of your property and in some cases, can expedite the sale of your home when the time arises. Also, depending on your state of residence, by installing solar panels on your home, you may earn the added benefit of receiving a state tax credit in addition to a federal tax credit, for your residential solar power system. When it comes to managing energy more efficiently and in the smartest way possible, trust in a N.E.R.D. With experienced engineers, unrivaled knowledge, and cutting-edge technology spanning the full spectrum of your residential solar power needs, the team at N.E.R.D. Power has got you covered.